I have serious misgivings over private schools, which strike me as exemplarily libertarian and intrinsically disposed toward widening the opportunity gap. Furthermore, i have dire concerns over the proliferation of religious schools, which introduce the added effect of confounding wealth, privilege, and influence with Christianity, pseudoscience, and authoritarianism. Let me, at the outset, set aside these concerns and affirm that no structural restrictions should be in place against the founding of private Christian schools, and that the burden of averting their spread rests with the adequate funding and management of public educational institutions, hence ultimately with us. I therefore wish to raise no objection to Charnika Elliott’s newly opened Noah–Christian Academy. The Valleys are ripe with well-(enough)-to-do isolationist Christian parents that should keep the academy funded for several years (although — as Christopher Hitchens and Daniel Dennett have argued, albeit orthogonally to one another — one of the best catalysts against organized religion may be institutionalized religious education). When she was a third-grade teacher at Roanoke’s Forest Park Elementary School, Charnika Elliott would play gospel music softly in her classroom. She’d pull aside students who shared her religious faith and quietly pray when no one else was around. When she was a third-grade teacher at Roanoke’s Forest Park Elementary School, Charnika Elbaz would play anasheed softly in her classroom. She’d pull aside students who shared her Muslim faith and quietly perform salah when no one else was around. Is it even conceivable that such a paragraph would lead into such a delightful, supportive story in the RT as the one above? Elliott appears to be an enthusiastic, engaging teacher whose students come to school rapt with anticipation. I’ll gladly grant her this, and i hope that it’s true. I hope teachers with her evident joy and dedication are as common now as they seemed to me in elementary school. I get that privilege is a difficult concept. I don’t always catch it (and neither do many headstrong residents of Roanoke and Salem). I don’t think we should be expected to develop a strong sense of privilege without the institutions in place to help us hone our senses. 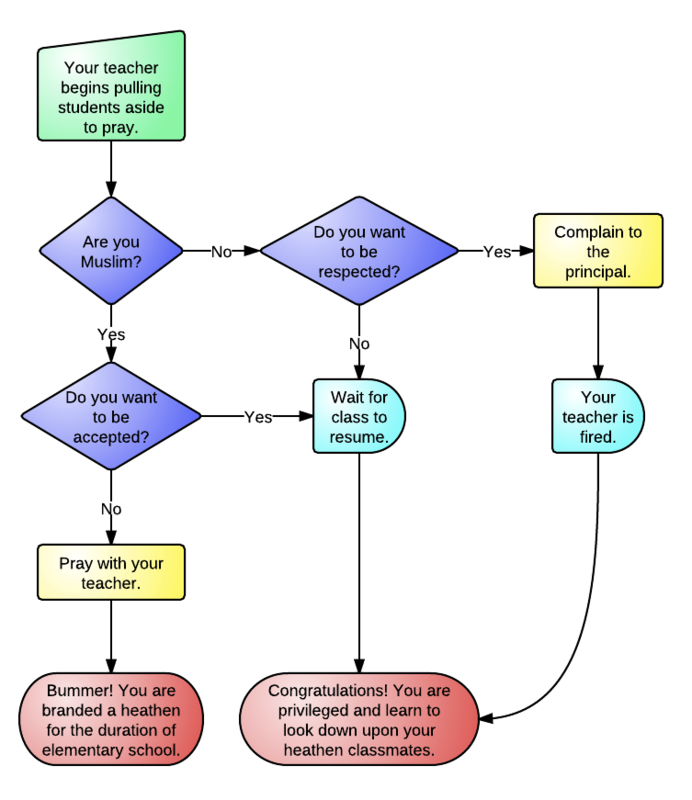 Fortunately, there is a simple solution to this predicament: Don’t pray during school hours. In fact, don’t pray in the school building. 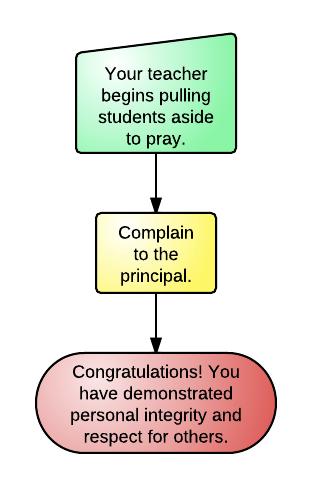 In fact, if you really care about your students’ emotional well-being and social maturity, don’t pray with them ever — unless you happen to find yourself at the same church (or mosque or temple or shrine or pastaria). And here’s why: You are not your students’ friend, or classmate, or cousin, or neighbor. Not first. First, you are their teacher. You are an authority figure. Your students emulate you, and they rely on you to prepare them for life in the pluralistic, cosmopolitan society that is ever-more-rapidly imposing itself upon them. And you will shape their understanding of communication, influence, compromise, and everything social. We don’t need to terminate every Christian — or Muslim, or nonreligious — teacher who abuses her authority, provided we clearly address the abuse and curb it in the future. Personally, i aspire to witness a generation of schoolchildren who can hone in on the important part. I won’t be praying for them. If they can do this then they’re already faring better than most of us. A version of this post originally appeared on Cory’s personal blog. 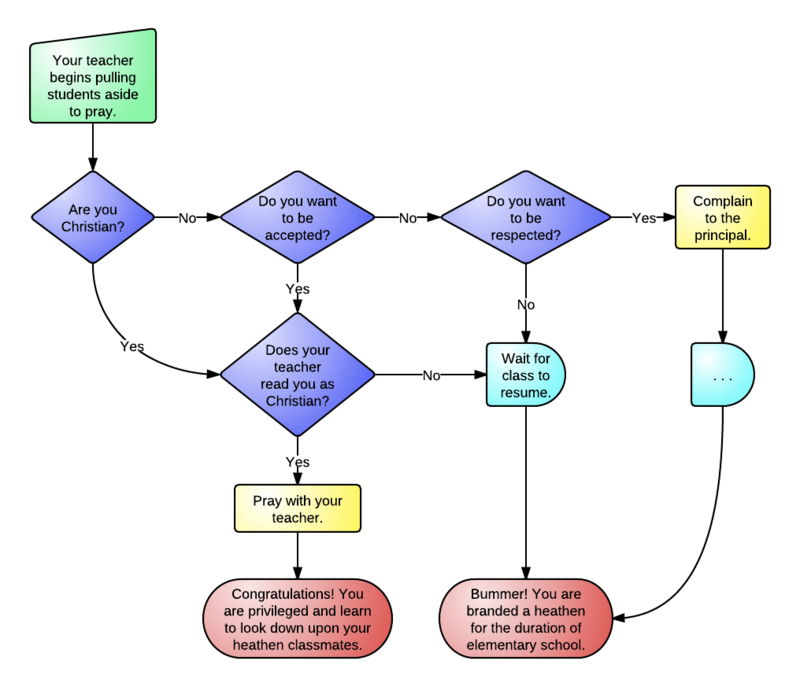 This entry was posted in Blog and tagged christianity, prayer, privilege, roanoke and new river valleys, school, separationism by Cory. Bookmark the permalink. Cory is a graduate student at Virginia Tech who studies algebraic geometry in the Department of Mathematics and network analysis at the Virginia Bioinformatics Institute. He is an active member of the Freethinkers at Virginia Tech and takes particular interest in alternative sexualities, sustainable living, and coffee. What is the flowchart software that was used to create these flowchart diagrams? It is Creately?